Mumbai / New Delhi: Higher revenues and lower costs will help the merging Kingfisher Airlines Ltd and Deccan Aviation Ltd earn between Rs250 crore and Rs300 crore a year, reducing losses by the same amount, said a senior executive of the UB Group that controls Kingfisher, and, in the process, help the merged entity turn profitable in 2008-09. 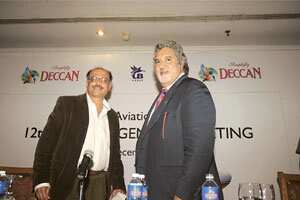 Mutual benefit: Vijay Mallya (right) will be chairman and CEO of the new entity, Kingfisher Airlines, and Deccan’s G.R. Gopinath will be its vice-chairman. Kingfisher will raise about $250 million through equity. Kingfisher had earlier expected to break even in 2009-10, while Deccan does not any longer give forecasts on when it will become profitable. The boards of both companies approved the merger late on Wednesday night naming UB Group chairman Vijay Mallya as the combined entity’s chairman and chief executive and Deccan founder G.R. Gopinath as vice-chairman. The two airline firms—Kingfisher and Deccan run eponymous airlines, one a full fare carrier and the other a no-frills service—have together lost Rs776 crore in the first six months this fiscal year. The merger, when it happens, will see most of Kingfisher’s operations merge into Deccan, whose shares are listed in India; the name of the listed company will be changed to Kingfisher. The top benefit from synergies emanating from the merger is higher revenues from optimizing use of aircraft of each airline on different routes at peak and non-peak hours, said Ravi Nedungadi, chief financial officer of the UB Group. “The opportunity is to maximize use of the asset (aircraft) by looking at time buckets in addition to sectors. Today, for example, it’s not very optimal to deploy a low cost offering on the Mumbai-Delhi route at peak hours. At that time, people will pay much higher fares. On the other hand, a Kingfisher plane in the afternoon or 11pm goes empty," Nedungadi said in a phone interview. “The idea is to play around with the offering. We will make Rs150-200 crore revenues with very marginal costs." Next, Nedungadi added, was the potential to reduce costs in engineering and maintenance support as also by way of securing discounts on insurance and bulk purchase of fuel. The merged entity “can have better negotiations with fuel suppliers as one entity. Even a 1% discount for 80 planes will make a huge difference," he said, quantifying the total cost reduction at Rs100 crore a year. In addition to these benefits, Kingfisher, Deccan and its advisers—UB had hired consultant Accenture Ltd to advise it on the merger—have structured the deal such that the two firms will be able to retain benefits of losses accumulated operating in a highly competitive business. UB Group plans to spin off its scheduled airline business and merge it into Deccan Aviation, retaining a plane charter and general aviation business with Kingfisher Airlines. “That way, about 90% (of Kingfisher Airlines) will be demerged and moved into Deccan, not the legal entity Kingfisher Airlines, thereby minimizing the tax impact," Nedungadi said referring to an India tax rule that disallows companies in businesses other than manufacturing, banking, telecom and software to carry forward losses and set them off against their future profits. The duo, which together has about a 27% share of the domestic market by passengers, had total losses of some Rs2,000 crore end of October. The new entity (Kingfisher) will raise about $250 million (Rs990 crore) through equity—a follow-on share sale or an offering of global depository receipts or a placement with institutional buyers—to retire debt and finance operations, Nedungadi said. The other benefit in Wednesday’s merger will be rights that Kingfisher will gain in flying overseas, an ambition of Mallya. Deccan completes five years of operation, a key eligibility under Indian aviation laws to be able to start international operations, in August 2008, and Kingfisher expects to fly overseas under that licence. Nedungadi said Kingfisher expects non-stop flying and superior in-flight customer service to help differentiate it from rivals. But an industry expert said it will not be an easy task for Kingfisher to establish itself on international routes from and to India, on which ticket sales are estimated by consultant Centre for Asia Pacific Aviation at Rs16,000 crore. State-owned National Aviation Company of India Ltd’s Air India accounts for more than 27% of this international market with 3% vesting with India’s oldest private carrier Jet Airways (India) Ltd. The remaining 70% is controlled by foreign carriers such as Lufthansa AG and Singapore Airlines Ltd, which are aggressively expanding their operations here in a market growing at 16-17%. With aircraft deliveries lined up for both Indian carriers the competition on overseas route is only likely to intensify. Air India plans to press into service new Boeing Co.-made aircraft non-stop between Bangalore and San Francisco by the first half of 2008—an often professed launch route for Kingfisher. “It may sound very interesting but where will you get 300-400 passengers everyday to fly (to California)," asked Ashwin Damera, CEO of website Travelguru.com.